What others should know: You need this to connect a shoebox compressor to a Maurader. What others should know: I bought this to be able to more easily gas my larger rifles. However upon receipt I discovered that both the Foster QD fittings on each end of the hose do not work! I cannot get the connectors on either end of this hose to actually connect to any of the meany foster QD's I have. What others should know: Fits well for extending hose length. You do need a double male fitting to go with it. 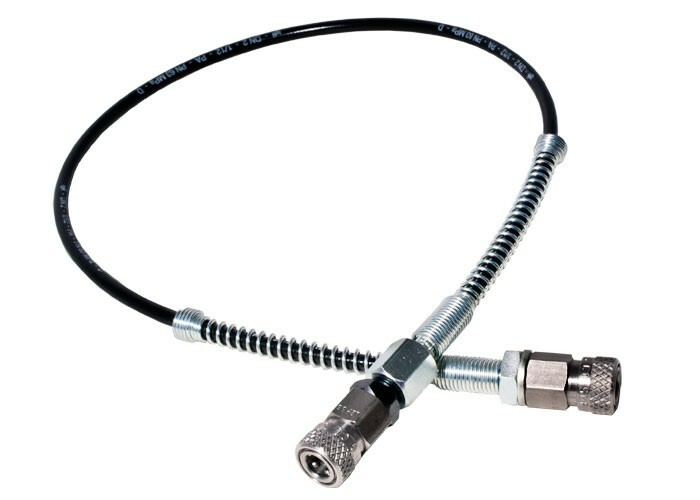 Things I liked: It is a well made high pressure connecter. What others should know: Very helpful for transferring air to rifle. Things I liked: The hose works perfect for the shoebox . What others should know: If your using this for the F10 shoebox , check the connectors don't leak . Mine did and found out 2 hours later after I checked the tank and saw the pressure tank needle didn't move . Better yet , take the connectors apart and add teflon tape to the threads , your welcome . Things I would have changed: leaked air had to tighten the conections prity bad for a 70 buck hose ? Things I liked: Works between my Shoebox compressor and my carbon fiber tank. Things I liked: it works pretty well now that i have tightened all the fittings. Things I would have changed: better quality control to make sure its put together before its sold. Things I liked: Excellent extension for getting your hand pump or bottle further away from the gun. Works well for filling different guns so that I can clip on different fill adapters. What others should know: You will need some adapter fittings to make this work, Pyramyd has them all. The double male Foster coupling will be needed to attach to the existing Foster quick disconnect on most hand pumps. Things I liked: Very good build quality. Things I would have changed: Would like it to be 6 inches longer. Things I liked: The length and flexibility are exellant. Very high quality hose and fittings. I feel safe using this hose at 4500 PSI. What others should know: Try it you will like it. Things I liked: As this is a micro bore hose this means fewer pumps to reach reservoir pressure. Also like the strain reliefs on each end. Things I would have changed: A little more length would be great, but it is workable as is. What others should know: not much else to add, it works as advertised with no problems. Things I liked: It works. Things I would have changed: Price & description. Its a little high given they do not say specifically what pressure it is rated for. I needed a fill hose from my compressor to my storage tank which can run upto 4500 PSI in theory. I set up my compressor and leave the room when I use this hose so if it blows I won't get hit with pieces. I also asked using the on-line chat, and found those helpers can't seem to answer any questions about a product where the answers aren't already on the website. What others should know: It doesn't list a pressure rating on the website at the time of this review. I have used it upto 4100 PSI for several fills, but I leave the room when it is filling. Also, on some fittings you may want to double check that you have pushed it all the way on, that it has snapped into the locked position, and then moved it back and forth to make sure. I had it pop off one fitting dumping a full tank of air, and IT DID APPEAR TO BE ON ALL THE WAY WITH THE LOCK RING IN A FORWARD APPEARING POSITION. Things I liked: Perfect fit with Shoebox. Things I liked: This hose worked great for the purpose I had in mind. It has held to full strength in operation. Things I would have changed: beef up where the hose fits into the ends. What others should know: This hose will work great as an extension to your existing hose or as a replacement. Things I liked: Hose is long enough. Things I liked: Foster Quick connects are the way to go! What others should know: Buy one! Just to keep have on hand, many valuable fittings on 1 line!